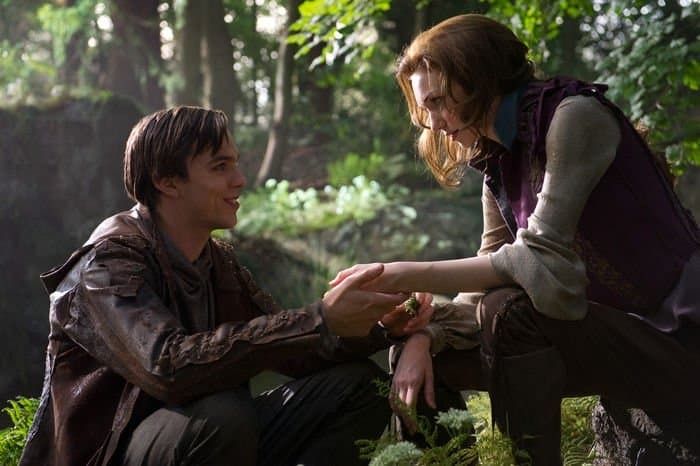 When Jack (Nicholas Hoult) was a little boy, his imagination was whetted by a bedtime story about a mythical war waged ages ago against a fearsome race of giants that had descended from the sky. Before his mother (Caroline Hayes) died soon thereafter, she suggested that he might even be related to Erik the Great (Craig Salisbury), the brave monarch who had led the valiant defense of Earth against the gargantuan invaders. Meanwhile, on the other side of the peaceable kingdom’ proverbial tracks, young Princess Isabelle (Eleanor Tomlinson) was being spoon-fed a similar tale about an epic showdown between good and evil. But she was read to at night by her doting father, King Brahmwell (Ian McShane), due to her mother’s (Tandi Wright) untimely demise. A decade later, we find the lowly farmhand’s path crossing with that of the future queen the day the headstrong teenager sneaks out of the castle to rub shoulders with the hoi polloi. At a puppet show, Jack rushes to her assistance the moment she finds herself being accosted by a menacing gang of ruffians. The damsel-in-distress becomes so smitten with the gallant lad that she informs her father of a desire to break off her arranged engagement to the insufferable Roderick (Stanley Tucci), an effete lout twice her age. Nonetheless, King Brahmwell would rather have his daughter marry a blue-blooded member of the Royal Court she doesn’t love than tie the knot with a mere commoner. Before the moment of truth arrives, however, fate intervenes in the form of a monk (Simon Lowe) who hands Jack a few mysterious beans. During a secret visit from Isabelle, one slips through the floorboards, takes seed under his house, and starts to grow rapidly, sweeping the humble abode and the Princess way up into the heavens. Soon, both of her suitors join the search party, scaling the mile-high beanstalk to an otherworldly realm in the clouds. Jack has no idea that the mammoth plant has also inadvertently reopened a gateway to the ground for an army of gigantic adversaries. And it’s not long before ancient hostilities are reignited over Isabelle and the fate of the planet below. Directed by Bryan Singer, Jack the Giant Slayer is an alternately enchanting and eyepopping adventure which must be seen in 3-D to be appreciated fully. Between the breathtaking panoramas and the daring derring-do on display, the picture amounts to a captivating, cinematic treat guaranteed to enthrall tykes, ‘tweeners, and just about anyone interested in seeing a classic fairytale brought to life. Fee! Fi! Fo! Fum! I smell a hit with the little ones!